For other people with the same name, see Publius Septimius Geta (disambiguation). Geta (/ˈɡɛtə/; Latin: Publius, or Lucius, Septimius Geta Augustus;[note 1] 7 March 189 – 26 December 211) was Roman emperor with his father Septimius Severus and older brother Caracalla from 209, when he was named Augustus like his brother, who had held the title since 198. Severus died in 211, and although he intended for his sons to rule together, they proved incapable of sharing power, culminating with the murder of Geta in December of that year. Head of young Geta at Glyptothek, Munich. 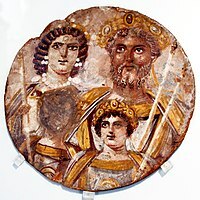 During the campaign against the Britons in the early 3rd century AD, imperial propaganda promoted the image of a happy family that shared the responsibilities of rule. Septimius Severus entrusted Julia Domna with the role of counsellor, Caracalla acted as the emperor's second in command, and administrative and bureaucratic duties were Geta's responsibility. In reality, however, the rivalry and antipathy between the brothers did not abate. Caracalla and Geta's mother, Julia Domna, served as their mediator during their joint reign. When Septimius Severus died in Eboracum in early 211, Caracalla and Geta were proclaimed joint emperors and returned to Rome. It is said that on the journey from England to Rome the two brothers kept well away from each other, not once lodging in the same house or sharing a common meal. Their joint rule was a failure. The Imperial Palace in Rome was divided into two separate sections, and neither allowed the servants of the other into his own. They only met in the presence of their mother, and with a strong military guard, being in constant fear of assassination. The historian Herodian asserted that the brothers decided to split the empire in two halves, when, by the end of 211, the situation had become unbearable. 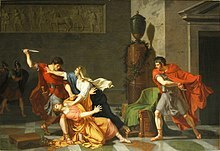 Caracalla tried unsuccessfully to murder Geta during the festival of Saturnalia (17 December). Finally, on the 26th of December, Caracalla had his mother arrange a peace meeting with his brother in his mother's apartments, thus depriving Geta of his bodyguards, and then had him murdered in her arms by centurions. Caracalla ordered the damnation of his memory, which was thoroughly carried out, as is clear from the archaeological record. Reportedly, Caracalla was thereafter tormented by guilt over his deed, but sought to expiate it by adding to this crime the proscription of all his brother's former followers. Cassius Dio stated that around 20,000 men and women were killed or proscribed on this charge during this time. On his coins, Caracalla, who became Augustus in 198, was shown with a wreath of laurels, while Geta remained bareheaded until he himself became Augustus in 209. Between 209 and their father's death in February 211, both brothers were shown as equally mature young men with a short full beard, ready to take over the empire. Between the death of Septimus Severus and the assassination of Geta, Caracalla's portraits did not change, while Geta was depicted with a long beard with hanging hairs, much like his father, a strong indication of Geta's efforts to be seen as the "true" successor of his father. ^ Birley 1999, p. 324. ^ Dunstan, William, E. (2011). Ancient Rome. Lanham: Rowman and Littlefield. pp. 405–406. ISBN 978-0-7425-6832-7. Wikimedia Commons has media related to Publius Septimius Geta.